SimpleTix is a professional e-ticketing service provider. 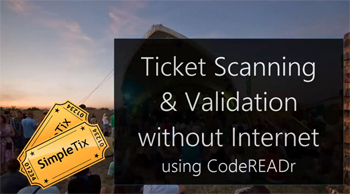 They recently published an excellent video showing how to use their barcode access control technology platform with codeREADr. Specifically, it’s about how to validate tickets when Internet connectivity is unstable. SimpleTix makes ticket databases readily available to their customers. In the video, they give simple and clear instructions on how to modify that database for uploading to codeREADr’s servers. When uploaded, the database is then available for downloading to codeREADr’s iOS and Android apps. It can be used for on-site validation without Internet connectivity as well. We call that ‘on-device’ (offline) validation. In this way, SimpleTix customers have two choices when it comes to barcode access control technology. They can choose online validation – a standard SimpleTix offering – and now offline validation (or both). What Do We Know About Barcode Access Control Technology? We have supported barcode access control since 2009. This has included 100,000+ events. Naturally, we’ve learned something. Clients should not assume there will be stable Internet access at the event’s actual point of entry. We advise to verify connectivity before the event. If there is only 3G/4G network connectivity, consider what could happen when a large crowd of smartphone-toting attendees arrive. If an app-user is using an online service and connectivity becomes unstable, the app will save the scans on the device. But, it will do so without validating them. However, the app-user is at least recording scanned tickets and checking for duplicates scanned by that device. When connectivity is restored, the scans are uploaded to our server (and to the SimpleTix server) for review. What many of our clients do is offer both an online and on-device service to their customers if their customer has no way of verifying connectivity before the event. In that way, the client has a choice of starting with online or offline scanning. While scanning to an online database is ideal, on-device validation is a close second. * This is because it not only catches invalid tickets. It also checks for duplicates scanned by that device. This data can then be periodically synced with the server. Kudos to SimpleTix for a job well done. Barcode access control technology is always changing, but they’re on top of the game. Note: We now also offer Auto Sync, which offers the benefits of on-­device validation with online syncing every 2 minutes.